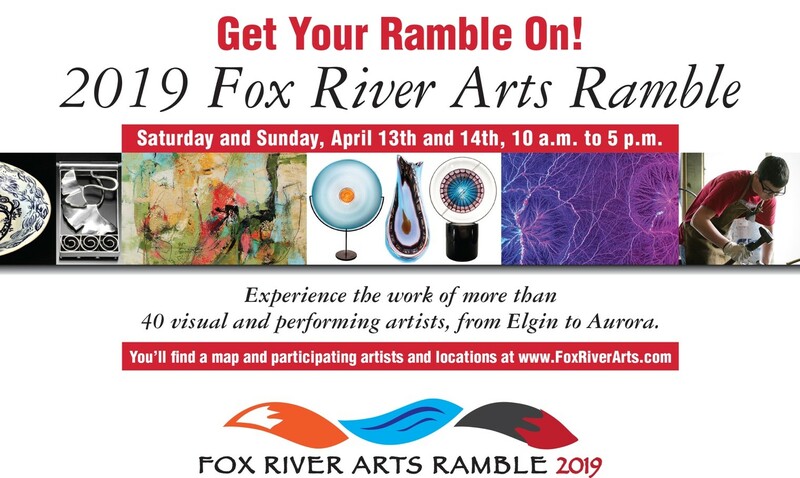 The second-annual Fox River Arts Ramble invites you to take in visual and performing arts from Aurora to Elgin, with your choice of more than 40 stops, including private and public galleries, artist studios, performance venues and more. 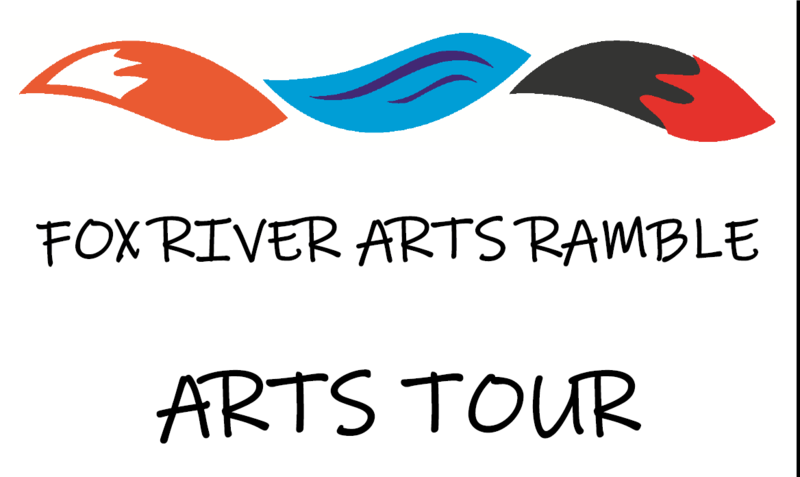 Fox River Arts Ramble is a two-day self-guided tour of art in the valley. The Ramble (a collaborative effort of the Fine Line Creative Arts Center, the St Charles Arts Council, and Water Street Studios) is coming to the Fox Valley on Saturday, April 13 and Sunday, April 14 from 10 a.m. to 5 p.m. each day, with some musical performances and receptions in the evening. In-kind sponsors of the event are Fast Color and Cooper-Hong. We thank them for their support of this event and the arts. The event includes nearly 50 participants, in a broad array of media and location, including a number of collaborative programs. Participating locations for this year’s event are in Aurora, Batavia, Geneva, St. Charles, Campton Hills, and Elgin. The Fine Line Creative Arts Center, St Charles Arts Council and Water Street Studios are delighted to bring this event to our community again this year. We encourage anyone interested in unique spaces, artistic minds, and engaging work to visit the nearly 50 participating art locations from Aurora to Elgin. Keep an eye out for the event signage to help direct you on your tour on April 13th and 14th. Ramble Headquarters Locations: These three locations offer refreshments, public restrooms and, of course, impressive collections of artwork and experiences for free. Join us at Fine Line for the chance to explore our classrooms while we have regular classes and demonstrations going on. Every classroom will be alive with activity, including weaving, spinning, blacksmithing, metal clay and more. Visit our two galleries for beautiful art, and shop for a variety of materials in our supplies shop. We will also have local artists selling their work. Take a stroll around our natural prairie, with grounds tours available, weather permitting. the SCAC’s signature Pop-Up Gallery program, which temporarily transforms non-traditional spaces into new art venues. The show includes the juried artwork – visual and video – of students in kindergarten through college. Ramblers who end their Saturday in the area are invited to attend the opening/artist reception from 5 to 7. Water Street Studios welcomes the work of three artists exploring the human experience without limits in “Earthly Delights” by Les Allen and Bruce Thorn in the Dempsey Family Gallery and “Eclecticism as I See It” by Perry Slade in the Chicago Capital Gallery. Water Street Studios will also feature an artist talk, art demos, gallery tours, and opportunities to meet and purchase artwork from our resident artists in their studios and artist members on site. Visit ArtinPublicPlacesSTC.com to find more than 170 pieces of public art in St. Charles. Get the Otocast app, find the AiPP project or St. Charles, IL, and tap on the welcome message to take a walking tour of more than 25 artworks. student volunteers. No museum entry fee. of Van Gogh’s Starry Night. pack-sized art pieces for $5 each. art league’s wide-ranging display of art. street art to florals and pop culture. authentic techniques with fresh inspiration. from the farm’s seven alpacas. including kilnformed and coldworked pieces. display in your home or office. Dinner & A Show for $59 per person. events, and more for children and adults. against the backdrop of nature’s seasonal beauty. sculpture, pottery, photography and more. and interaction with other artists. nature spirits as they manifest in trees and rocks. original photography in custom wood frames. Care before it tours the country. Von Ehr creates abstract and floral artwork. Don’t miss her show specials. media, and work by guest artist Molly Bitters. context of our custom framing gallery. her study of yoga, mythology and fairy tales. The Fine Line Creative Arts Center features two galleries with local artisan pieces and a supply shop. The Kavanagh Gallery presents “FL@40,” an exhibit commemorating the 40th Anniversary of Fine Line by showcasing the talents of faculty members past and present. Additional programming includes demonstrations in the teaching studios and trunk shows from local artists Nancy Krahn (jewelry design), Amy Simpson (fused glass), Matt Brej (ceramics), and Jennifer Chou (fiber). Fine Line invites Ramblers to come take a stroll in their prairie and enjoy the day. The St Charles Arts Council will feature, as part of their Pop-Up Gallery program, the 7th Annual Student Show at The Keep Creative (220 N. 4th Street). The Student Show includes the juried artwork – visual and video – of nearly 50 students, from throughout the entire Chicagoland area, in kindergarten through college. Ramblers are invited to end the day or return to this gallery to attend the Opening/Artist Reception from 5 to 7. Refreshments will be served. The SCAC thanks The keep Creative for the use of this space. The SCAC is also featuring their Art in Public Places project during the Ramble, which catalogs and celebrates over 170 pieces of public art in St. Charles. This cultural experience is rich in stories, images, and detail, including the web site, a brochure, and an Art Tour. For the Tour, get the Otocast app, find St. Charles on their worldwide list, and tap on any of the 25 images. You’ll hear the artist tell the story of the piece and their artwork, or if the artist is unknown or deceased, people who know the artwork’s “story”. You can also read about the work, and follow links to relevant resources. Check some of them out while you’re “rambling”! Water Street Studios invites Ramblers to join them for an artist talk with exhibiting artists Les Allen and Bruce Thorn on Saturday at 10 a.m. and Perry Slade on Sunday at 12 p.m. On Sunday, Ramblers can also join in Open Sketch from 1-3 p.m. On both days Water Street will also offer art class demos, gallery tours, and an opportunity to meet their 30 resident artists in their studios. Water Street members Kathie Collinson, Dawn Jones, Felicia Raschke, Jessica Fincher, Justin Lirot, and Todd Johnson will have displays and be available to discuss their work. Water Street Studios is a nonprofit art center located in Batavia, Illinois. Our mission is to help make the arts more accessible to the Fox Valley region and beyond. Our vision is to be a cultural hub in the Midwest. We provide our ever-growing community with art classes, artist studios, community events, gallery exhibitions, free after-school art programs, outreach, private events in a historic venue, and more. Visit http://www.waterstreetstudios.org or visit us during Public Hours: Thursday-Sunday 12:00-5:00 p.m.